78" length sets posts a perfect 6' apart! 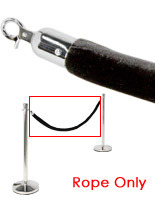 Durable chrome hooks keep rope secured to stanchion posts! 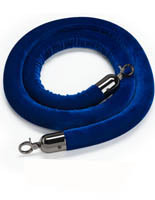 Blue velvet rope provides a splash of color to upscale environments! 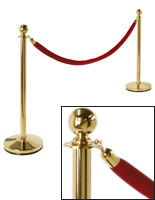 These rope barriers are designed to be configured with our post stanchions. 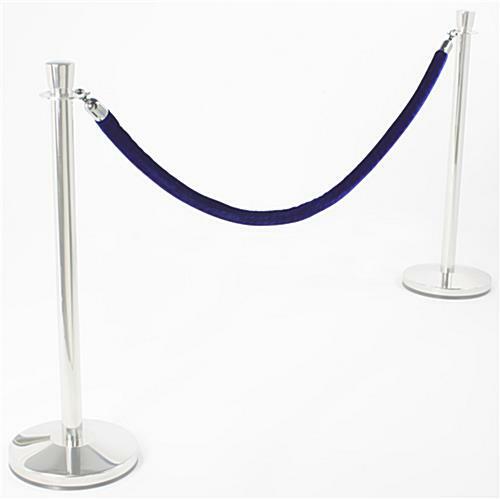 These blue velvet crowd control barriers provide an upscale means of keeping customers and guests in line or way from valuable exhibits. 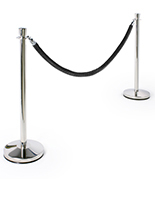 You will find these rope barriers in a wide array of locations, from banks or ticket lines to theaters, nightclubs, car shows, museums and more. The velvet lines can be used to separate & organize crowds, form lines, protect displayed items or close an area to the public. These upscale rope barriers are designed to blend in seamlessly in even the classiest establishments like exclusive clubs or high-end events. 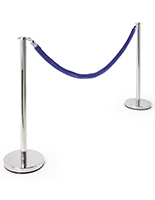 These crowd control barriers are crafted from a foam rope core, covered with striking blue velvet. 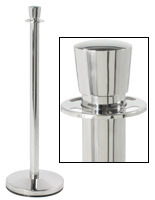 Polished chrome end caps and hooks allow these ropes to attach to either polished chrome or matte black stanchion posts. The rope barriers feature sturdy & durable hooks, designed to stand up to busy retail or commercial environments. The barriers are 78" long so that, when attached to two stanchion posts, the posts will stand a perfect 6' apart. This will leave your rope barriers with just the right amount of "swag" (for safety reasons, the lowest point of your rope should hang at just about 24" above the floor). 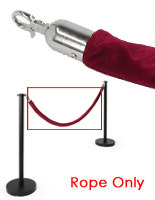 Configure these rope barriers with stanchion posts to create a classic means of organizing crowds. These ropes were a perfert fit for the event. Unfortunately, the ropes weren't available in this color locally and with me being very picky about every detail, I knew these ropes would look great. Very fast shipping and great packaging. We wouldn't call you picky, we'd call you artistically mindful :) We're happy that we could help, Lydia! Thanks for the great review. Looks great with my stanchions my only complaint is that you had no purple ropes. Displays2Go processed and shipped the order as indicated on the website. It arrived in the timeframe indicated and was packaged well. 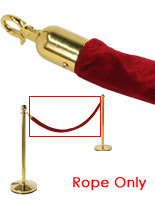 The Blue Stanchion Rope is great quality as opposed to the flimsy or foamy ropes you see in some places. They are full and firm with a crushed velvet type feel. I am highly satisfied with this order and recommend it to anyone reading this.